September 25, 2017 / Jackson Heights Neighborhood / Food & Wine in Jackson Heights Queens / Queens Buzz NYC. A weekend ago [9/16], I had an opportunity to attend the annual Viva La Comida Festival in Jackson Heights. 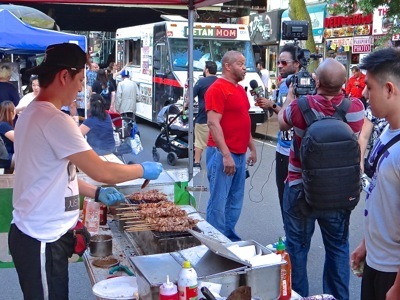 The festival originated in 2011 or 2012 as a sort of mini Vendy Awards festival for local food trucks and vendors who mostly served the Jackson Heights and nearby neighborhoods in Queens. They were accompanied by a whole host of local entertainers who were featured on the stage at Dunningham Triangle. 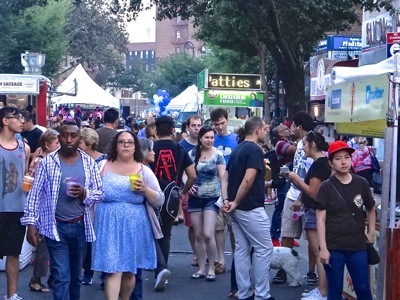 Today, six or seven years later, the basic tenets of the festival have held fast, but it has evolved into a more holistic celebration of Jackson Heights culture, including the food ... but with fewer trucks. This year there were two trucks, which was down from about six trucks back during the program inception. Although I hasten to add, that several food carts were added offsetting some of the decline of the food trucks. On the entertainment side, the event has blossomed, featuring numerous local musicians, dancers and theatrical performances. One of the most enjoyable aspects I experienced this year at Viva La Comida was an incredible Latin jazz band called Los Macheros. I'm not sure, but the name - which appears to have been invented - could be mixing the meanings of macho [male] and hacheros [axes] to mean something very loosely translated as the 'male axes' or a take off on the word mecheros which means [cigarette] lighter. Los Macheros are a seven member Latin jazz band that includes a talented vocalist, two guitarists, two percussionists, and while I was there I enjoyed a very talented duel between the flautist and the violinist which you can see below on the video when I post it. The music moved people to dance and numerous couples were swinging to the jazzy tunes the entire time I was there. CLICK here to read the rest of our report about Viva La Comida Food Festival in Jackson Heights Queens NYC. October 18, 2016 / Jackson Heights Neighborhood / Jackson Heights Restaurants / Queens Buzz. 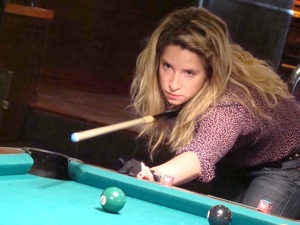 I headed over to BQE Billiards and Bar for a photo shoot last week. They were working on developing a new website and I was helping them create the food photos. The side benefit of this excursion was that I was also able to partake in the feast that followed, where we all sat around and enjoyed sampling much of the food that was photographed. 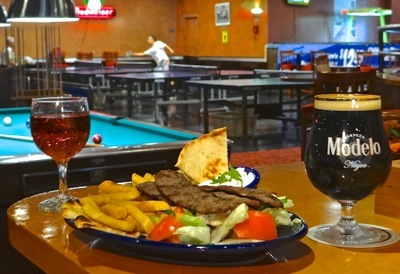 In the photo at right is the gyro plate sitting atop a counter space located within the pool area and overlooking the ping pong and arcade sections of BQE Billiards and Bar in Jackson Heights. This story is going to include a review of some of the food I sampled, as well as delving into the history of one of Jackson Heights intrepid small businesses. 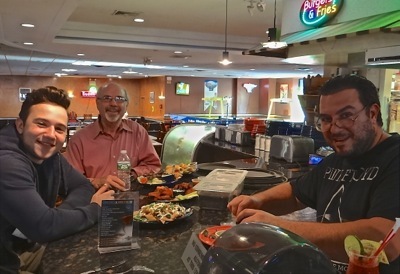 BQE Billiards and Bar was founded 25 years ago by four partners, two of whom remain involved in the business today. 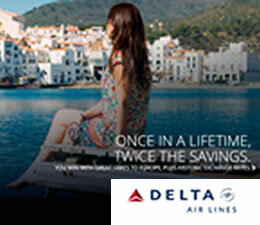 So get comfy as we begin by traveling back in time, to the not-so-ancient Greece of the 1960's. One of the founding partners, Nick, told me that as a boy he used to keep a watch in a Grecian winemaker's vineyard. As he grew older he was given the responsibility for tending a flock of sheep on the hills of Greece. Around the time he became a legal adult, Nick talked to his father about leaving the small town he grew up in, to seek out places and opportunities where he might be able to make a better go of things. His father, while reluctant to see his son depart, understood the calling of the young man, and sent him on his way. Nick sought work aboard a ship, the SS Andreas Panou. The ship ran into technical difficulties in the Greek port of Piraeus, so Nick and his crewmates were sent ashore to get a bite to eat, since the mess hall had no electricity. The foreman wanted the young lads to return before they had been able to get some food and they refused. The foreman and the Captain subsequently discharged Nick and his friend in October 1965. Nick recalled how he sought and secured passage working aboard another ship. Less than six months later, in March of 1966, while on a transition in Vancouver, Canada; he noticed a newspaper written in Greek. Since he had not read anything in Greek for weeks, he bought the paper where he learned that the SS Andreas Panou had crashed off the coast of Spain. In the photo at right, from left to right, are Andreas, Nick and Theo of BQE Billiards and Bar in Jackson Heights. Click here to read the rest of our story about the history and the late night restaurant dining at BQE Blliards and Bar in Jackson Heights. Jackson Heights Neighborhood / Queens Buzz. This is a report about a billiards tournament which took place in the Jackson Heights neighborhood in Queens NY. Many of the top players in the nation were there, including a top ranking female and last year's pool champion. This was for the Tony Robles tournament in the Jackson Heights section of Queens. Click here to view the story of the pool tournament at BQE in Jackson Heights Queens including photos. Jackson Heights Neighborhood / Jackson Heights Restaurants / Queens Buzz. This is a review of the Jackson Diner Indian Restaurant which is located in the Jackson Heights neighborhood of Queens NY. 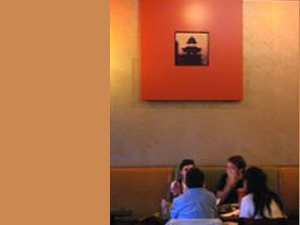 The Jackson Diner is an Indian restaurant serving Indian food tailored to suit the American palate in Jackson Heights. Click here to read our report about the Jackson Diner - Indian restaurants in Jackson Heights. September 24, 2012 / Jackson Heights / Food in Queens / Queens Buzz. On Friday evening the 82nd Street Partnership hosted Viva La Comida at Dunningham Triangle on 82nd Street at Baxter in Jackson Heights. The event was a fun, quirky preamble to the Hispanic Month activities that officially began on Sunday with the Hispanic Day Parade [click for Hispanic Day Parade report & photos]. I arrived while it was still light out. City Councilman Danny Dromm, Seth Taylor and City Councilmember Julissa Ferreras were standing for photos sandwiched between two men who’s names I will try to obtain and post at a later date. A performance by the youngsters from the Mestizo Art Center followed, much to the delight of the warm and enthusiastic crowd. I made my way over to the food trucks where I tasted some delicacies and met interesting people … click here to read the rest of our report on Viva La Comida festival hosted by the 82nd Street Partnership in Jackson Heights. 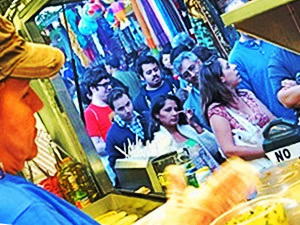 The photo to your left was taken from the inside of the Solber Pupusa food truck at the Viva La Comida festival on 82nd Street in Jackson Heights. October 5, 2015 / Jackson Heights Neighborhood / Queens Restaurants & Queens Food / Queens Buzz. 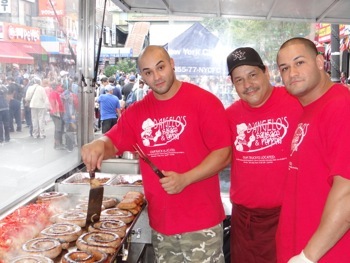 A couple weeks ago I attended the fourth annual Viva La Comida Festival in Jackson Heights. The festival began as a showcase for some of the neighborhood food trucks in tandem with dance and music cultural performances. The first year the event was held at Dunningham Triangle with some of the trucks lined up along 82nd Street, but the space was too tight for the venue and busy street. In the subsequent years 82nd Street was blocked to enable pedestrian traffic and picnic tables, and the stage was moved from facing a narrow sliver of Ithaca Street, to facing 82nd Street. Originally the festival ran through the day and into the evening, but this year it was scheduled to begin at noon and run until 7 pm. I arrived about 2 pm and stayed a couple of hours as things were just getting going. There were folks lined up in front of several food trucks and others seated at the picnic tables. I noted about a half dozen food trucks, some of which were returning from prior years. And before deparating I saw a dance performance by a local group. 'Viva La Comida' means 'Live Food' which is intended to be a cheer of sorts, kind of like "long live the Queens". Salud. September 22, 2014 / Jackson Heights Neighborhood / Jackson Heights Restaurants / Queens Buzz. Saturday afternoon I headed over to Dunningham Triangle at 82nd Street & Baxter in Jackson Heights. The third annual Viva La Comida Festival had begun earlier in the day and I decided to check it out. 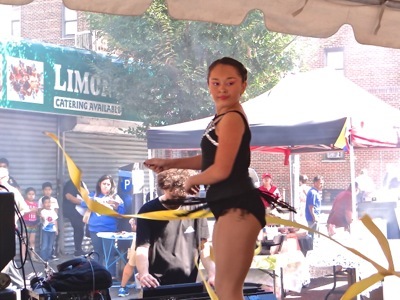 They had blocked off 82nd Street between Roosevelt Avenue and Baxter and had converted the short one block adjacent to Dunningham Triangle into a performance area - complete with elevated stage. Along 82nd Street there was a musical / dance performance going on with a distinctly Latin flavor, reflecting the indigenous roots of many of Jackson Heights and neighboring Corona residents. My first stop was the D'Angelo food truck for a spicy Italian handmade sausage with sauteed peppers and onions on a fresh semolina bread. It tasted even better than it sounds. We'll have more about D'Angelo's later in the story, including a couple more photos of the sandwich I devoured. I headed over to the main stage to see what was going on. 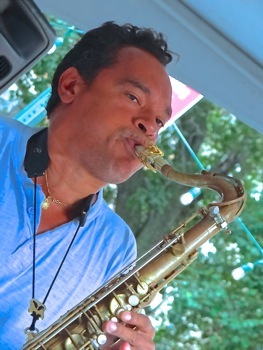 By late afternoon the Jay Rodriguez Trio had taken the stage and began playing some really good Latin flavored jazz tunes. They played their instruments like jazz magicians, deftly transitioning the melodious rhythm from one musician to another in a string of rhythmic solos that had the audience jamming to the beat. I started photographing them doing their thing and came up with a separate photo slide show which will show them gettin' down. I visited the Jay Rodriguez website and the music on the site, is a bit more artsy and esoteric than what they played for us at Viva La Comida. Special thanks goes to outgoing 82nd Street Partnership Executive Director Seth Taylor, as well as iwantmorefood curator Jeff Orlick. We'll have more about both of them and their past and future endeavors in the full report later this day / week. La Portena Restaurant & Steak House closed in April of 2014 following a fire in the building. La Portena Argentinian Steakhouse isn't exactly the kind of restaurant that would come to mind when you think of Jackson Heights ... that is unless you live there. 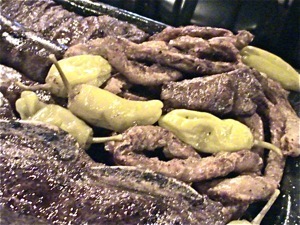 La Portena Argentinian Steakhouse is located at 74th Street and 37th Avenue in Jackson Heights. It's quite a popular restaurant which is what first caught my attention. While Indian, Bangladeshi, Thai and Nepalese restaurants first come to mind when thinking about Jackson Heights / Elmhurst restaurants, there's an entire Latin American flavor to the restaurant mix in the neighborhood - and the food and service are both very good. Click here to read a the full review of La Portena Argentinian Steakhouse, including more photos. Jackson Heights Neighborhood / Jackson Heights Restaurants / Queens Buzz. 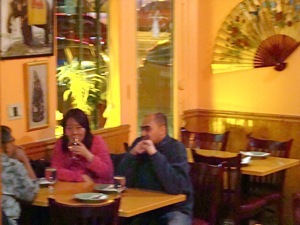 Tonight I ventured out to a Thai restaurant in Jackson Heights that I had discovered on pure happenstance. I arrived at the restaurant around 7.30 pm on an cool overcast Saturday evening. More than half of the sixty seats had already been filled and it seemed the waiting staff had fallen a bit behind. As I sat there waiting, I began to doubt my choice. As I surveyed the restaurant I noted that many of the customers were Thai, which I took to be a good sign, as I was looking for real Thai food, not some Americanized version of it. Within the next five to ten minutes, things completely turned. The waiting staff turned up the energy and within minutes it seemed that everyone who had been waiting now had a drink or appetizer sitting in front of them … myself included. 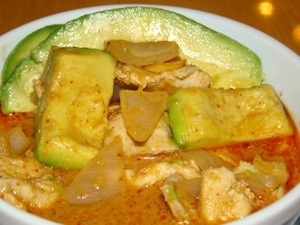 Click here to read the full review of Arunee Thai restaurant including photos. Jackson Heights / Update February 7, 2010. The Cavalier closed its doors today. 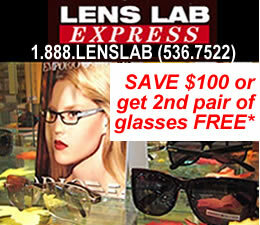 The details may be obtained via a link which we added to the following story. Jackson Heights / January 18, 2009. I spent part of last Friday evening at the Cavalier Restaurant and Lounge in Jackson Heights, enjoying the return of a retro forties lounge act. 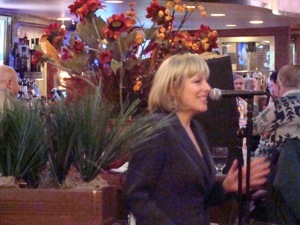 Bethany Wild sang some beautiful tunes reminiscent of the jazz age, while the crowd enjoyed dinner and / or drinks. Her soft, sensuous voice wafted through the lounge with piano [via track] in the background. The crowd included an eclectic mix of people who might have enjoyed similar tunes in their youth, as well as young couples in their twenties, thirties and forties. It was a nice mix of ambiance, alcohol, acoustics and alliteration. 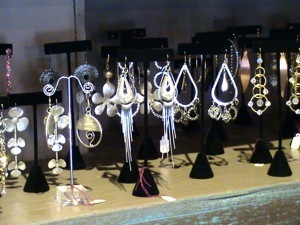 Bethany returns next Friday from 7 to 10 pm. April 2018 / Jackson Heights Neighborhood / Queens Restaurants / Queens Buzz NYC. This section is dedicated to reviews of restaurants in the Jackson Heights and Elmhurst neighborhoods of Queens NY. Jackson Heights and Elmhurst are known for a wide range of diverse restaurants including Indian, Thai, Nepalese, Argentinian and other Asian and Latin American cuisines. 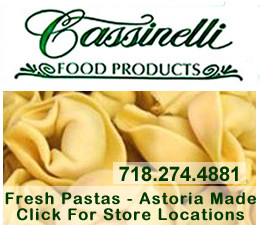 Click here to go into the Jackson Heights Restaurants section of this site. February 2019 / Restaurants in Queens / Queens Buzz NYC. 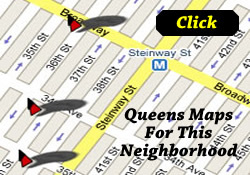 This section includes reviews of Queens restaurants. 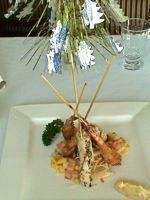 Click here to view the Queens Restaurants review section including reviews of Astoria, LIC / Long Island City, Sunnyside & Woodside, Jackson Heights & Corona, Flushing and Jamaica. Jackson Heights & Elmhurst / Queens Buzz. Jackson Heights and Elmhurst provide local residents with a number of shopping venues, from shopping centers along 37th and Roosevelt Avenues, to 74th Street the hub of all things Indian, to Northern Blvd which includes a number of auto dealerships, to the Queens Center Mall in Elmhurst. 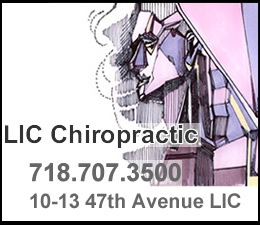 Click here to go into the Jackson Heights & Elmhurst Shopping section of this site. 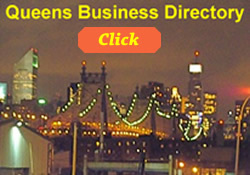 Click on the icon below to view business listings of Jackson Heights & Elmhurst Queens. Use the category or search links to conduct your own search.